What Is Your Program For Children and Teens? We provide peer support groups for children and teens ages 6-18. We also offer a young adult support group for ages 19-30. We provide no private therapy or counseling. Participants of the program meet others who have experienced similar losses because of illness, accident, suicide or homicide. Children and teens are grouped together according to age and meet every other week for 90 minutes. Children participate in “talking circle” time and also have opportunities to process grief through art, play, sandplay, and games, which all assist in helping them cope with their grief. Adult groups for the surviving parent/primary caregiver meet at the same time the children meet. All groups are facilitated by trained volunteers and coordinated by the professional staff at Common Ground. Common Ground does not charge a fee for its services. Because the Center is a nonprofit organization, we rely on contributions from individuals, corporations, and foundations. We invite families to make a tax-deductible contribution. No. We hold informational orientation sessions. Once a family has completed the orientation session and filled out the appropriate paperwork, they are offered an every-other week support group. What Happens at the One-Hour Orientation? We explain the program to the adults and children. Questions are answered, and a tour is given of the Center. Coming to orientation does not mean the child/teen becomes a participant. We encourage adults to let the children and teens make the final decision as to whether or not they want to participate. How Long After the Death Does a Family Need to Wait Before Calling? A family may call and start the process as soon as they are ready. We believe each person and family grieves differently, therefore allowing the family to be the best judge of when they are ready to deal with the death in a support group. How Long is a Family Expected to Attend Groups? Since the uniqueness of, intensity and duration of grief vary with each individual and family, we encourage the child/teen to start and stop when they are ready. However, when a family is enrolled in a group, we expect regular attendance. A family is expected to call when they will be absent. Continuity of attendance is important to build the peer support group into a supportive and safe environment for grief work. What if a Child/Teen Needs Private Therapy? Common Ground does not provide therapy or counseling. 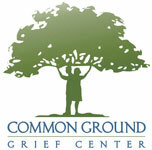 We will provide a list of referral therapists who counsel children/teens with grief. How Do I Get My Child/Teen Started? 1. A parent or guardian calls 732-606-7477. A brief phone intake is completed about your family and the person who died. We then will schedule your family for an orientation appointment. 2. You and your family come to your informational orientation appointment. You will receive application forms that we will explain at that time. 3. After the orientation, your family will discuss participating. If interested, you complete and return the application forms. 4. When we receive your completed application forms, we will call you and inform you of the appropriate group meeting.